Thanksgiving is just around the corner, so I wanted to take a moment to share some great Michigan State University (MSU) Extension resources on gratitude. Photo by tinah at Morguefile.com. Health and nutrition educator Shannon Lindquist writes that people who practice gratitude are more proactive in taking care of their physical and mental health, exercise on a regular basis, make healthy food choices, make and keep yearly health appointments, develop positive coping methods for stress, and have a sense of happiness and optimism. Those sound like great benefits to me. What are ways that we can show gratitude? Children and youth educator Makena Schultz lists seven ways to practice gratitude in her article “‘Tis the Season of Giving Thanks: Why Gratitude Is Important in Leadership.” She describes creating a gratitude letter, a gratitude list or journal, or a gratitude jar; engaging with a gratitude partner or in grateful contemplation; and making a gratitude visit to a deserving person. Learn more about leadership and gratitude by reading her article. Photo by earl53 at Morgueufile.com. Gail Innis, health and nutrition educator, shares the importance of modeling thankfulness and gratitude with your children. Gail encourages us to discuss with our kids the gifts that they received from a family member and have them draw a picture or write a note to thank them. Make a phone call to a long-distance relative with your child to say thank you. Volunteer with your children in local charitable events. Tell and read stories about generous people, characters or events. Take time each day to talk about at least one thing you each are grateful for. Gail includes more in her article about teaching an attitude of gratitude to young children. I am grateful for my wife; my daughters; my dog, Cocoa; and our home in the U.P. I’m also grateful to work with all of you to further the mission of MSU Extension and the opportunity to make a difference in Michigan. What are you thankful for? Let’s remember as we continue forward in the month all the blessings we have in our lives. Each year, our Michigan State University (MSU) Extension associations choose a representative to attend the Public Issues Leadership Development Conference held in Washington, D.C. This year, April 10 through April 13, a large Extension crew attended. MSU Extension educators Denise Aungst, Wayne Beyea, Karen Fifield, Frank Gublo, Christine Heverly, Gail Innis, Stan Moore and Garret Ziegler joined Mike Kovacic, Katie Nicpon and me. On Monday, we took part in several sessions focused on the conference theme ‒ Innovation: The Story of Extension. One thought that I really want to share is that MSU Extension is an agency that helps people across the lifespan from the cradle to the grave. We have an impact on our communities and our neighbors throughout their lives. It is such a powerful imprint that we are privileged to impart. Through our work, we as individuals and as an organization leave our legacies in the communities that we serve. On Tuesday and Wednesday, we had the opportunity to meet with our senators and congressional representatives, and their staff members and thank them for their continuing support of MSU Extension. MSU Extension receives federal funding through the Smith-Lever Act of 1914 that established the Cooperative Extension Service, and every year we say, “thank you,” and share the great work that we do because of their investment. Denise Aungst, Wayne Beyea, Karen Fifield, Frank Gublo, Christine Heverly, Gail Innis, Stan Moore and Garret Ziegler, Mike Kovacic, Katie Nicpon and Jeff Dwyer with Senator Debbie Stabenow. Denise Aungst, Wayne Beyea, Karen Fifield, Frank Gublo, Christine Heverly, Gail Innis, Stan Moore and Garret Ziegler joined Mike Kovacic, Katie Nicpon and Jeff Dwyer with Senator Gary Peters. A final important highlight for me personally was the opportunity to get to know my MSU Extension colleagues and learn about the work that you’re doing and the outstanding impact that you’re making. In a world where we’re wearing so many hats and sometimes only see the faces of those we share offices with, it is so important to have opportunities to meet each other and get to know each other from all over the state. The first cohort of Michigan State University Extension staff members to graduate together with Master of Science degrees in human development and family studies: community services attended a reception for graduates at Cowles House April 26 at the invitation of President LouAnna K. Simon. This was the first time MSU’s Department of Human Development and Family Studies (HDFS) offered this degree targeted at MSUE staff. Previous participants in this online degree program from MSUE completed as individual students without the benefit of the cohort experience. As a cohort, the women started as a group and finished together, connecting during the learning process through face-to-face and online meetings, and phone conferences. The group made the commitment to work hard to get their master’s degrees while working full time, and they did it in an area that will have great benefit to MSUE and the Children and Youth Institute. I’m told they did some pretty incredible work for their capstone projects that will bring great benefits back to our organization. The group included eight members: Laura Anderson, Kristina Bowers (former MSUE student intern), Andrea Caron, Eileen Haraminac, Becky Henne, Gail Innis, Lisa Myers and Michelle Warczinsky. MSUE first cohort members attend reception at Cowles House with President Simon. 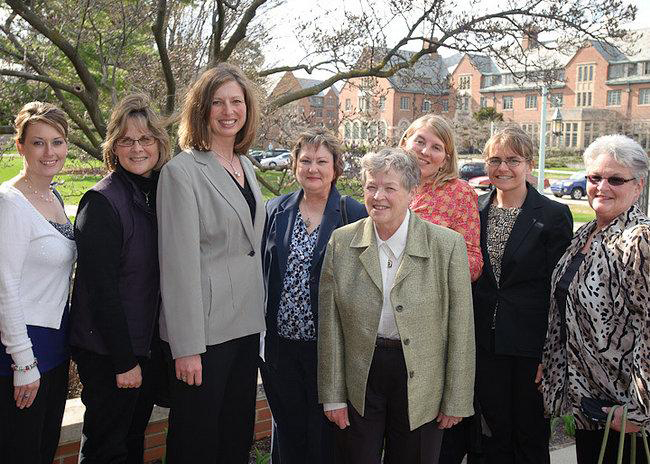 (Left to right) Shelly Warczinsky, Lisa Myers, Becky Henne, Eileen Haraminac, Dr. Simon, Andrea Caron, Laura Anderson and Gail Innis. This online degree was an important collaboration between the Department of Human Development and Family Studies and MSUE. Dr. Barbara Ames directs all of the graduate majors within that department. Many faculty members within HDFS contributed to this major. Retired Extension specialist and professor Joanne Keith and Health and Nutrition Institute director Dawn Contreras, whose overall role was advisor to the cohort, also taught courses. Gail Innis, Michigan State University Extension educator, is making a difference in Sanilac County. Despite county and state budget cuts, Gail continues to provide parenting education programs with support from local collaborators like the Department of Human Resources and the Child Abuse Prevention Council. She has been involved with the successful implementation of these programs since 1990. Gail and her staff follow Sanilac County families for three years providing positive parenting messages and assistance. While working in Extension, Gail obtained a bachelor’s degree and is continuing her education by working toward a master’s. Katherine Hale, Southeast Region Extension educator, shared her appreciation for Gail’s persistence with me and it struck me as another great example of MSUE folks persevering through challenging times by simply doing what we can do – carry on with the programs that help people to improve their lives, regardless of our circumstances and uncertainty. Thanks for being yet another inspiring model for your colleagues, Gail!